Boat is located in Venice,FL. 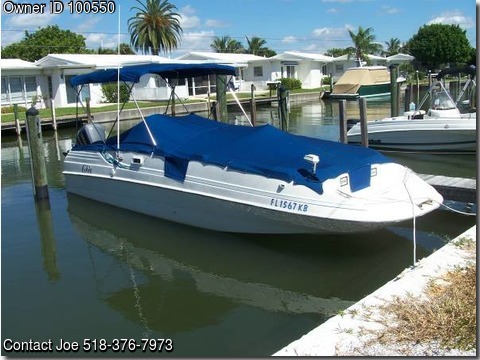 Please contact the owner @ 518-376-7973... 1998 Cobia 256 Coastal Cruiser with Yamaha Saltwater 250 HP Engine Boat well-cared for, in excellent running condition. Includes Bimini top; modified and very secure two-piece mooring cover; helm and VHF cover; electronics include Lowrance LMS-350A fish finder/plotter/GPS w/new transducer, user manual included; Sony 4-speaker stereo system with auxiliary inputs; new bottom paint on 3.26.15; recent service includes new water pump kit on lower unit; tilt cylinder resealed; engine has a 6 inch lift jack plate; new VHF radio and antenna on 3.20.15; new spark plugs, cylinder heads replaced on 5.22.15; 8 hours on new heads, only 348 hours on engine; new stator on 6.25.15; two new batteries on 7.10.15; boat dived and cleaned every month; all service records from 1998 available; bow inserts and two tables with poles also included; recent USCG inspection; boat is in water and can be seen at the Venice Yacht Club; call for an appointment: 941-375-8052 or 518-376-7973; No brokers Please!